An antique-inspired floral design in an ornamental color palette of red, blue, turquoise, and orange on a denim blue field gives this rug an exceptional look. Each rug is hand tufted for easy care, heavy wear and an unbeatable texture. 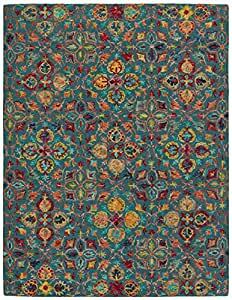 An Amazon brand – An antique-inspired floral design in an ornamental color palette of red, blue, turquoise, and orange on a denim blue field gives this rug an exceptional look. Each rug is hand tufted for easy care, heavy wear and an unbeatable texture. Beautiful design, vibrant colors, great quality and great price. After buying multiple synthetic rugs (that were this same price) I was fed up with how cheap they were and how they werenât durable at all. I was looking for a wool rug but was afraid they were all going to be too expensive. Iâm so glad I found this as an option. Itâs a great price for a 100% wool rug and I can immediately tell a huge difference in quality compared to my other rugs.